This Rotary Arm Stretch Wrapper is an ideal assistant machine to a production line and a necessary part of an automatic packaging line. It is widely used in chemical, electronics, food, beverage and papermaking industry. No-human operation. 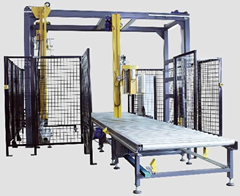 Loaded pallets feeding, film loading, wrapping, film cutting, pallets exiting, all works automatically. It employs a touch screen PLC controller. Automatically caution alert and faulse alarm. Easy to operate and durable.